Snippets of Jack: "Parley? That would be the French"
"Parley? That would be the French"
Parley, the special pirate code, proves to be quite useful. If pirate points their gun at an enemy or someone like that, the person be demand Parley, which requires the pirate to take the accuse to the captain. THe code permits the accused from being harmed until the parley is complete. 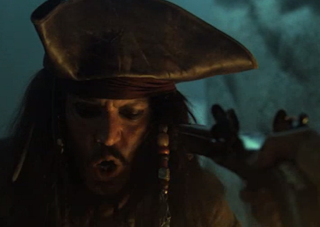 The code saves Elizabeth's life in the early scenes of Pirates of the Carribean: The Curse of the Black Pearl, and does Jack some good in the later scenes. Of course, Jack being Jack can't just demand parley as Elizabeth does; he has to make it a joke by forgetting what the code is called and making the other pirates say it for them. Jack: "Parlily.....? Palililo.... pally....... parsnip.....? Parsley? Polly? Polly." Jack: "That's the one! Parley! PARLEY!" Pirate: "Parley? To the depths whatever what idiot thought of parley!" Jack: "That would be the French." Jack can't stop being the mad old Jack even when a gun is being pointed at him! But then again, I guess that's why we love him so much, am I right?